Mix 1 1/2 cups sugar, the margarine, cream cheese and eggs in large bowl. Stir in flour, cream of tartar, baking soda and salt. Cover and refrigerate dough 1 hour. Shape dough into 1 1/4-inch balls. Mix 1/4 cup sugar and the cinnamon. Roll balls in cinnamon-sugar mixture. Place 2 inches apart on ungreased cookie sheet. Flatten each ball with bottom of drinking glass. 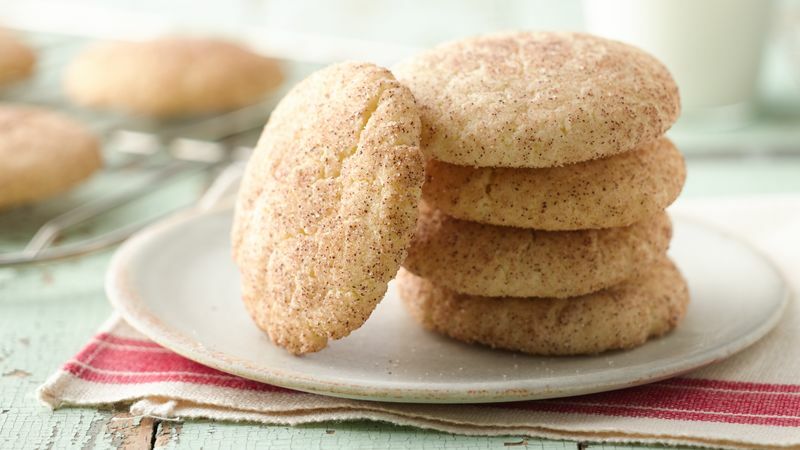 Long ago, little cookies that could be made quickly were given the nonsense name Snickerdoodles. Rise to the occasion! If using self-rising flour, there is no need to add cream of tartar, baking soda and salt. For a fun flavor change to these sweet little gems, use apple pie spice instead of cinnamon.